When it comes time to replace the furnace in your home, it’s easy to become overwhelmed with information about features, efficiency, and cost. We want to provide you, the customer with an easy checklist when it comes to selecting a furnace. In the couple of paragraphs below we will define a few terms for you, and tell you why they matter. If you have any questions at all about what you have read, we are happy to discuss in more detail. According to Lennox.com the British Thermal Unit(BTU) is a measurement of heat energy. One BTU is the amount of heat required to raise one pound of water by one degree Fahrenheit. Furnaces are rated in BTU's per hour(BTUh) and this rating will determine how much space the furnace can efficiently heat. Residential furnaces can range from 30,000 to 150,000 BTUh. Paul's Heating & Air Conditioning will size your new unit appropriately based on the size of your home, likely replacing the old unit with the most similarly sized furnace available today. Most of the residential furnaces we install range from 70,000-135,000 BTUh. 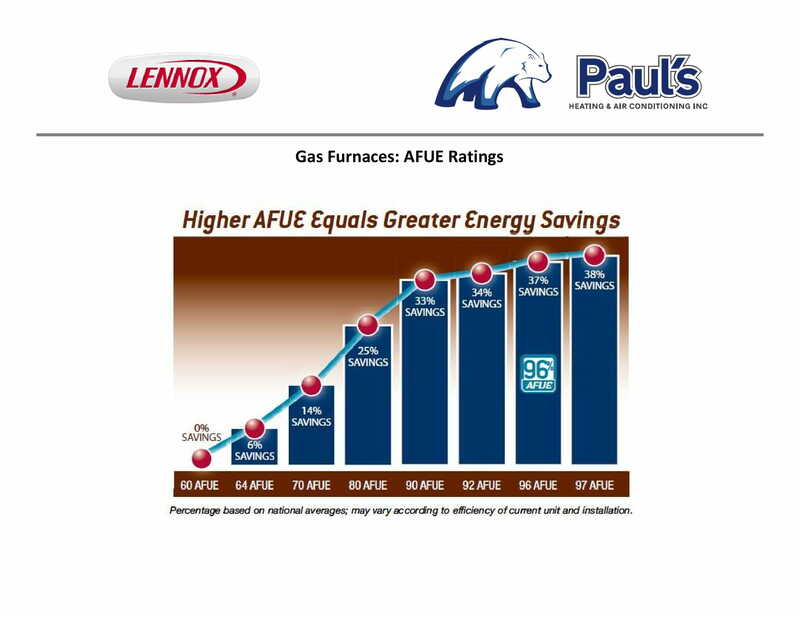 According to Lennox.com the Annual Fuel Utilization Efficiency(AFUE) is the percentage of heat produced for every dollar of fuel consumed. Consider it like the miles-per-gallon on your car, the higher the AFUE, the lower your fuel costs. If you were to install a 96.0% AFUE furnace and burn $1.00 of fuel, $0.96 cents of that dollar would have been used to heat the air in your home, and $0.04 would have escaped through the exhaust pipe or other heat transfer. A high efficency furnace will be 90.0% AFUE or higher, most homeowners are choosing to install high effiency furnaces due to rising fuel costs. 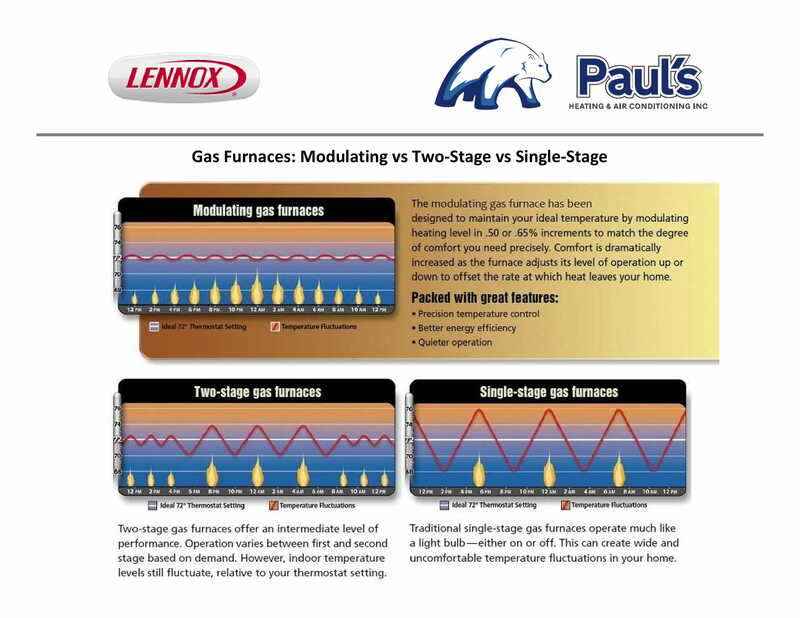 Most of the residential furnaces that Paul's Heating & Air Conditioning offers are between 95-98% efficient. Modulating - When the thermostat calls for heating, the furnace will burn at 30% of the BTUh capacity for aproximately five minutes, increasing the burn rate by 0.5-1% until the space reaches the required temperature. Two-Stage - When the thermostat calls for heating, the furnace will burn at 65% of the BTUh capacity for approximately twelve minutes. If the space does not reach the required temperature, the furnace will move to burn at 100% of the BTUh capacity until the space reaches the required temperature. Single-Stage - When the thermostat calls for heating, the furnace will burn at 100% of the BTUh capacity until the space reaches the required temperature. The blower motor is what moves air through the ductwork of your home. When considering what type of blower motor to pair with your furnace there are a few different types to note: Fixed Speed, Constant Torque, and Variable Speed. Each of them have different levels of efficiency, expected operating life, comfort level and servicing needs. Fixed Speed - Operates at 100% capacity or is off, is 50-60% efficient, has 40,000 hours of expected life, the temperature swings can be as much as five degrees different that thermostat setting, and may need more maintenance than constant torque or variable speed. 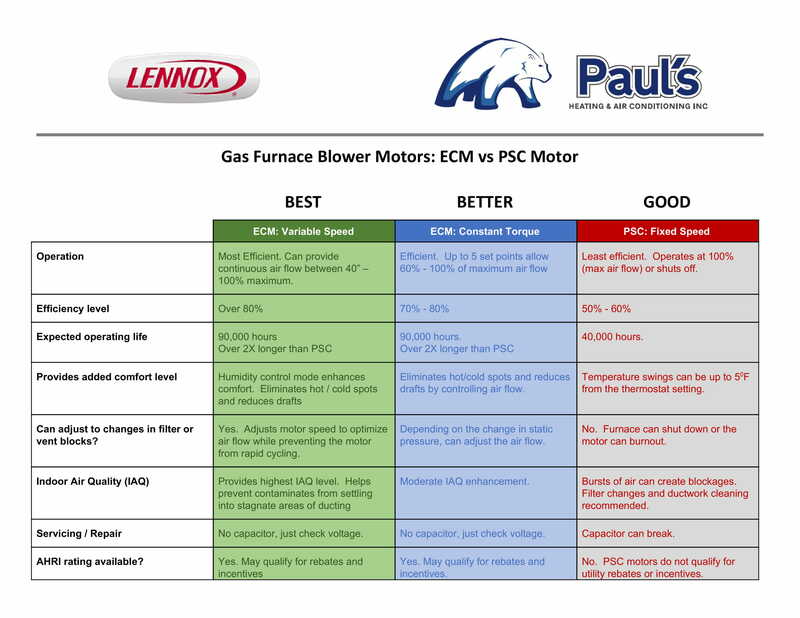 A fixed speed blower is the only available option available to customers considering a single-stage furnace. Constant Torque - Operates at up to five set points ranging from 60-100% capacity, is 70-80% efficient, has 90,000 hours of expected life, the temperature swings are eliminated due to controlled air flow, and requires less maintenance than a fixed speed blower. Constant Torque blowers are available for two-stage and modulating furnaces. Variable Speed - Operates between 40-100% capacity to provide continuous air flow, is over 80% efficient, has 90,000 hours of expected life, provides the most consistant temperature levels, and requires less maintenance than a fixed speed blower.